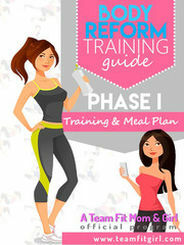 THIS 12-WEEK TRAINING PROGRAM IS DESIGNED SPECIFICALLY FOR WOMEN SEEKING A SIGNIFICANT CHANGE IN BODY SHAPE, LEAN TISSUE AND ENERGY. 5 custom designed strength workouts that target every area of your body. Team only video portal to familiarize yourself with some of the unique exercises and moves from Team Fit Mom and Girl.